I must have made a wrong turn as I walked down the hallway away from Rich’s office. I thought reception would be on my right, but, instead, I was looking at a row of offices I’d never seen before. In an attempt to get my bearings I glanced around and bam! there he was in the office across the way. Cam was working like a vortex: he had a phone on one ear and a headset wrapped around the other. An assistant was sitting in a chair next to his desk, sliding files in front of him as he talked into the mouthpiece in soft, rapid tones. I tried to scoot on past without him seeing me, but he suddenly looked up and waved me in without missing a beat of rhythm on the phone. I heard him ask the person to hold, and he jabbed the button like a prizefighter. “Yeah, well, don’t worry about it, Cam. I really do wish you great success; I hope you knock ‘em dead.” Okay, so it was a cliché. “You didn’t, though,” he said as he took his call off hold. “I didn’t what?” I stage whispered, but as far as he was concerned, I was already gone. I gave a little wave, which he didn’t see, and started to turn toward the door. That’s when I saw it, lying open on the desk next to his stack of files. It was another one of those typical San Diego days: the sky was blue and bright, and the ocean was sparkling as it slapped its waves onto the shores of Mission Beach. I was sitting on the seawall, lost in thought and filled with a new sense of—what was it?—optimism, I guess. It made my day, seeing that pad on Cam’s desk. Something had stuck, and it was no small thing at that. I was actually impressed with his decision to give up management and go back on the phones. That took some kind of guts. 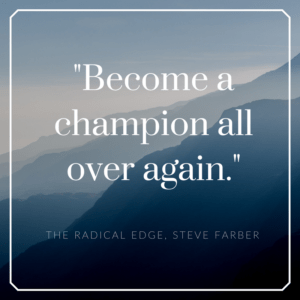 Most people would have quit and gone in search of a new place, but he chose to stay and become a champion all over again, and this time he’d be doing what really trips his trigger. Come to think of it, I think Cam may just have found his frequency. So I had to wonder, maybe Cam’s world had changed a little, but did that qualify me as a change the world practitioner? I decided I wasn’t ready to claim that, exactly, but it sure felt like progress. Best of all, after my exposure to the WUP, my conversations with Agnes, and the guidelines from the gathering at SKATE!, I felt that I had something tangible and helpful to bring back to the Jims on my next trip to Michigan. had come up behind the seawall and ambushed me with a kiss. “Sadie! How you doin’, you big poochie?” I gave her a mighty scratch behind her ears. Since Smitty had been house-sitting for Edg and taking care of Sadie for the last couple of years, I knew that the boys had to be close by. I spun around on the seawall, jumped down onto the boardwalk, and scanned the area. I’d already realized that Edg’s reappearance hadn’t been as sudden as I’d thought. He’d been back in San Diego for a while without my knowing it. His baby, XinoniX, the company he’d founded and retired from, was looking at an acquisition, and he’d come to town to help with the due diligence process. When Janice told him about my new coaching engagement, Edg started doing what he does best. He helped me without my knowing it. However, not at the expense of the fathomless joy he takes in messing with my head. He wrote the note the same morning that Smitty had given it to me; he set up the lunch with Agnes and then came by the diner to spy on us. That’s when he paid the tab. He got into my apartment, left his skateboard in my garage, and scribbled in my Wake-Up Pad just for fun. The guy delights in seeing me twist, squirm, lurch, writhe, and all the other words that you’ll find in the thesaurus under struggle. In other words, he gets deep satisfaction in watching me try to come to terms with myself. Do you have any idea how that makes me feel? Like the luckiest human being on the planet.